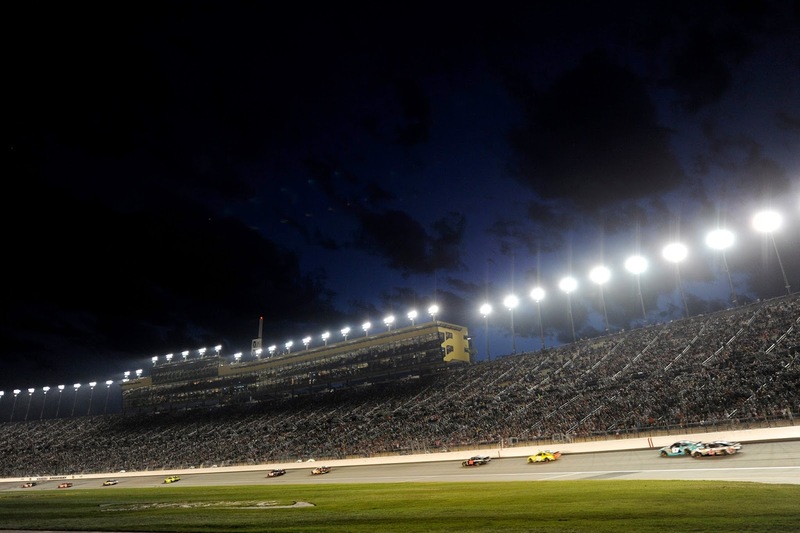 Kansas Speedway hosts two NASCAR weekends each season, and in 2014 it hosts the first race in the Contender Round in the new Chase for the Sprint Cup format. Here’s a look back at the short history of this 1.5-mile tri-oval. Kansas Speedway, owned by International Speedway Corporation, opened in 2001. The idea of a speedway in the Midwest took off in 1996, with the focus moving to Kansas City in 1997.Construction began in May 1999, and preferred seats went on sale that July. In May 2000, NASCAR and IndyCar announced events at the track in 2001. The IndyCar Series raced at the track from 2001-2010. Initial seating capacity for the track was 75,000, but upfront demand for the seats in 1999 led to an immediate increase to 82,000 seats. Additional seats were added in 2003 (1,600 seats) and 2005 (1,500); also in 2005, a 7,000 square foot concession and restroom building were built. Lights were added at the track from mid-2010 to early 2011 – this event coincided with the addition of a second NASCAR weekend in 2011. The track was reconfigured in 2012, adding a road course to the facility as well as repaving the oval and adding variable banking. The addition of the six-turn, 2.37-mile road course brought sports car racing to the facility in 2013 and 2014. In addition to the three top NASCAR Series and the IndyCar Series, other series that have raced at the track include the NASCAR Winston West Series, the ARCA Racing Series, the USAC Silver Crown Series, the Indy Lights Series and the GRAND-AM Rolex Series/TUDOR United SportsCar Championship. Learn more about the track and purchase tickets for upcoming races at www.kansasspeedway.com.